French Railways’ VIIA arm has added a second rail motorway service into Calais, from Turin. 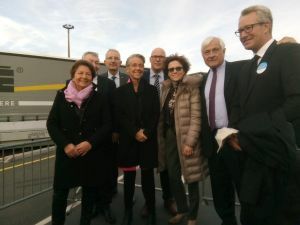 The new route, which runs twice a day from the Italian city’s Orbassano terminal, complements the existing twice-daily route from Le Boulou on the French-Spanish border, to Calais, inaugurated in March 2016. Transit time is 18 hours. The service is operated by Fret SNCF and and the Italian state rail company’s Mercitalia subsidiary. Trailers from the service can be moved by port tractors to Calais’ ferry berths for unaccompanied transport to Dover or can be picked up by road-going tractors for accompanied operation on the ferries or the Channel Tunnel. 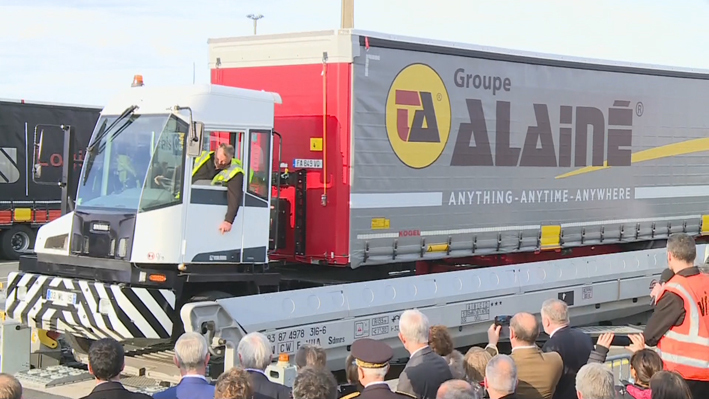 Like the existing service, the new Turin route uses a special design of rail wagon with pivoting platforms that allow the use of standard road trailers. Retractable pockets on the wagons allow the trailer wheels to be recessed, keeping standard height European trailers within the rail loading gauge. Other existing road-rail services that use cranes to lift trailers on and off trains require the use of specialised Huckepack reinforced road trailers. VIIA also says that the system gives much faster loading and unloading than other methods and allows bookings for the service to be made up to one hour before departure. It says that road hauliers using the services can cut their costs by 15% compared with over-the-road operation. It also allows them to avoid France’s weekend lorry ban and other restrictions on truck operation. VIIA said the new service, which can carry up to 40 trailers on each train, would held reduce road congestion as well as reducing CO2 emissions and other pollutants by up 80% compared with over-the-road operation. The Le Boulou-Calais route carried 6,500 trailers in 2017. However, this figure is dwarfed by the 64,700 units on VIIA’s service from Le Boulou to Bettembourg in Luxembourg, established in 2017. VIIA is also planning to add a stop in Macon, north-east France to one of its existing services.